Jillian Hollis earned her first career win on the Symetra Tour at the 2019 IOA Championship, and she did it with a late birdie and a late eagle in the final round. After struggling in very windy conditions for much of the round, Hollis rolled in a birdie putt on the 15th hole, then eagled the par-5 16th. After parring out, she finished at 4-under 212, one stroke ahead of runners-up Julieta Granada and Amy Lee. While it was her first win on the Symetra Tour, it wasn't the first high finish for Hollis, who joined the turn after turning pro in 2018. She finished eighth earlier this year in the SKYiGOLF Championship. Hollis had three Top 10s in her rookie year of 2018, including a runner-up finish. In her 12 starts in 2018, Hollis showed great touch with the putter, ranking fourth on the Symetra Tour in Putts Per GIR and sixth in putting average. Before turning pro, Jillian had a stellar amateur career that included reaching No. 23 in the world in the World Amateur Golf Rankings. 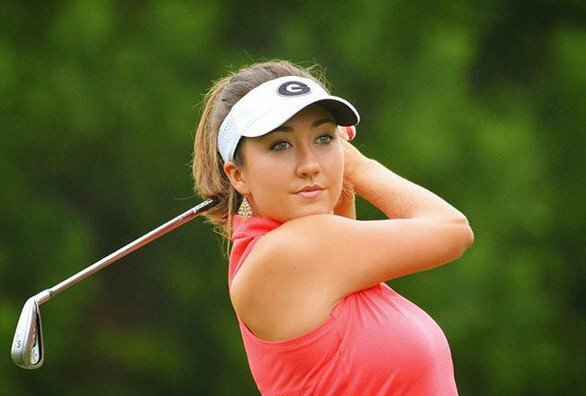 An Ohio native, Hollis played college golf for three years at the University of Georgia. She earned All-America honors all three years. She recorded four NCAA wins and 19 Top 10 finishes. You can follow Jillian Hollis on social media: She's @freewilly_jilly on Twitter and @jillianhollis on Instagram.